This shot first appeared on the ‘Do You Know’ page and my thanks to Terry Malloy for his excellent investigating which has solved just what it was and who owned it. Thomas Burrows & Sons were based at Wombwell which is about 5 miles South East of Barnsley on the road to Mexborough. They had a varied selection of vehicles and like most independent operators quite a few were second-hand, but this particular coach and its sister GWX 168 No 58 were both delivered new to Burrows in March 1948. 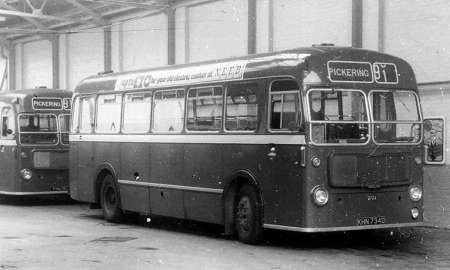 Terry also came up with the information that both were withdrawn from service in December 1963 and that this particular coach was hired in 1952 by West Yorkshire Road Car for at least 2 Blackpool journeys. Maybe West Yorkshire hired it for the 1952 summer season if you know please leave a comment. I have to admit I am not all that knowledgeable about Wilks & Meade the body builder of this coach but according to Terry again they were part of the Leeds based coach operator Wallace Arnold. If anyone can supply information re Wilks & Meade it would be appreciated. Off at a bit of a tangent here but Wallace Arnold owned a few service bus operators, in the Leeds area they had Kippax Motors and Farsley Omnibus and in the Scarborough area they owned Hardwicks. I am not sure where Hardwicks were based but I know that dad and I circa 1963 went from Scarborough to the terminus somewhere in the Yorkshire Wolds and back again just to say we had done it. I know it was a Leyland Titan and I think it had rear doors. I think somebody somewhere could probable do quite a good article about Wallace Arnold, could it be you perhaps? On summer Saturdays, West Yorkshire had an enormous traffic from Leeds to both the east and west coast holiday resorts. To cope with this, they set up a temporary overflow bus station in Saville Street, Leeds, and hired literally dozens of extra coaches from independent operators to act as duplicates to the normal stage carriage services. Passengers were directed onto these hired-in duplicates, and when they were full, conductors would collect the fares before each coach left, going direct, non-stop to the appropriate destination. This is, no doubt, how GWX 167 and its sister were used. Your mention of Hardwicks is interesting – though I could not have told you the name. I remember in 1966 going on a school geography field trip to Scarborough. If we are talking about the same company, the service went (like the clappers) along the A170 as far as Allerston. (Don’t ask me why it didn’t continue through Thornton le Dale to Pickering which was a mere 3 miles farther on and a much more obvious destination – but it didn’t!) Dark red all-Leyland double decker with platform doors as I recall it. I’m not sure if the depot might have been in Allerston. A correction to my original copy I stated that Wallace Arnold owned a bus company in Scarborough called Hargreaves this was wrong my thanks to C Youhill for pointing out it was actually Hardwicks. He also added the following the routes information is most interesting. The two PD2 double deckers were brand new to the outstation, as was a PD3 in 1966 which was joined in 1968 by its twin after original allocation to Farsley Omnibus. Also various Wallace Arnold coaches were downgraded for the service to Snainton, Hutton Buscel and Ebberston. A large contract to RAF Fylingdales was also undertaken from Scarborough. Ref Hardwicks and Fylingdales contracts. When Scarborough & District was formed following the changes with Hardwicks & United the contract was operated using two minibuses. These were painted in a revised livery, fitted with semi coach seating, and were only allowed inside the perimeter of Fylingdales if driven by one of there own staff. Scarborough & District drivers were not allowed on the property. Hardwick’s operated from a depot in Snainton. They were started in a small almost farm building then moved twice till eventually to the depot they used until they ceased operations. I travelled to school for 5 years by Hardwick’s and knew all the drivers very well. Excellent service, not like some of todays buses. Regarding the garage, In Snainton on a small side road off from the A170 (down from what was until recently Des Winks VW and is now a garage owned by a second hand car dealer) and before the Coachman Pub is a large garage with full height sliding doors. I recall this being used by Hardwick’s, though do check, I was 4 at the time. Hardwick’s operated from a small garage in Victoria Road Scarborough (now a car park next to the newsagent. The terminus was always Ebberston as far as I recall with the buses travelling via the A170 to the ‘top stop’ then going down the village and bearing left at the bottom to return to Snainton (almost passing the garage referred to earlier. The reason why Hardwick’s service did not extend beyond Ebberston to Pickering was because this was in the days before deregulation. 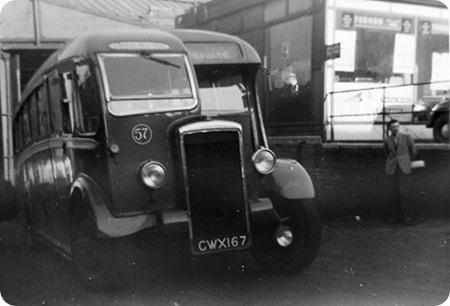 United Automobile held the licence and operated a Scarborough-Ebberston-Pickering-Ripon service numbered 128. Between Scarborough and Ebberston the United and Hardwick’s service travelled the same road. In regulated days operators were very protective of their services and competitors would be kept well at bay. The original Hardwick’s service started in the 1920s and therefore when regulation began they would have been granted the licence to operate their existing service which was just between Scarborough and Ebberston. If you would like to see some old Hardwick’s timetables and photos of the double deckers someone has mentioned I invite you to take a look at my Fotopic site: here. Paul Carter, in his various volumes concerning operators in Cambridgeshire, states that the name of this bodybuilder is usually spelt wrongly – it should be Wilks and Meade. This firm built three double deck bodies on Daimler CVD6 chassis for Premier Travel in 1950. The quality of construction proved to be decidedly poor, and major rebuilding had to be undertaken by the operator very early in the lives of these vehicles. Thanks for that I have corrected my spelling. The contract to Fylingdales was operated by Wallace Arnold from Scarborough and Whitby. I lived in Snainton, and you could almost set your watch by the bus coming through, 7.25 am, 3.25pm and 11.25 pm. They were always in a rush. Hardwicks buses were started by George Hardwick in the 20’s I think. Some of the drivers I remember include, George Alden, Walter Ford, Eddie Stephenson, John Jennings, Sid Ward and Malcolm Chambers. My granddad was Harry Meade (the Meade side of the Wilks & Meade partnership). My mother who is still alive and living in Yorkshire is Harry’s daughter. Like many others, I’m always fascinated by little coincidences connected with bus and coach operation, so here’s quite a good one concerned with the massive West Yorkshire summer traffic to the East Coast for which the two Burrows Daimlers were often hired. West Yorkshire had a large amount of Bristol K6Bs, one series of which were registered GWX 101 – 130. When brand new, GWX 108 (751, later DB23) was converted by the Company into a double deck coach and was a beautiful vehicle in rich cream and maroon, with coach pattern lovely green moquette seating. It appeared regularly on service 43 to Scarborough, and so it is practically certain that GWX 108 will have been duplicated by, or at least shared the A 64 road with, Burrows’ GWX 167/8 on the coastal route at some time or other. I suppose some would say "Little things please little minds" – guilty as charged yer ‘onour !! Well, Chris, you’re great on reminding us of nostalgic moments from our past. I have only a vague memory of DB23, having only seen it briefly in Rougier Street without a chance to get a good look. However, do you remember the rather less successful treatment of DB31 (LWR 417)? As for your reference to WY’s massive summer traffic from Leeds, it reminded me of a (typical WY) scenario when loading passengers onto hired-in coaches. In addition to the stage carriage service to Scarborough, there was an express service, that cost something like 2/6d or 3/6d more. However, because there were so many stage carriage duplicates, the passenger experience was generally the same on either service. There were separate stage carriage and express queues in Saville Street, and we had strict instructions not to allow to two streams of passengers to get mixed up because the company didn’t want any passengers to realise they had paid more for exactly the same journey. You missed a treat Roy in not having a really good look at DB 23. I had a school friend who was "well in" at Grove Park Works and we were allowed to see it in there just as it was completed. It was a magnificent sight, never having even been in the open air at that time. We were very impressed indeed, and I always felt really sorry in later years when it was returned to service bus work and painted red. I believe that DBW 31 (8’00" wide) had been in normal service a short while before being converted, and what a sad contrast it made with the other beauty. It was initially done in black with incongruous and cheap looking silver metal mouldings of an appearance far from professional – looking like something from one of the very smallest "streamlined modern" coach building concerns. The black areas were later changed to standard red which was no improvement at all. It was, to be fair, very rarely that WYRCC slipped up like that, their design and workmanship normally being impeccable. I tend to agree with your sentiments Chris. Pictures I have seen of DB23 show it in the very attractive cream and maroon livery you describe. However, the livery inflicted on DBW31 was quite simply ‘over the top’, even for the flamboyant fifties. The style was just too fussy, and combined with the built-up front nearside wing, looked altogether wrong. To some, a little like turning a silk purse into a sow’s ear! West Yorkshire definitely slipped up there as you say, and one can’t help thinking that if they had applied DB23’s simpler coach livery to DBW31’s fuller lines, it would have lent a far more prestigious air. Definitely a case of ‘less is more’. I wonder what it looked like from the back…. I have fond memories of Tommy Burrows buses from circa 1968 when my impoverished wife-to-be and myself used to catch their 99 service from Wakefield bus station to Rawmarsh via Barnsley and Wombwell. It was a cheap summer Sunday afternoon out and quite a long ride time wise from Sandal, Wakefield to the Rawmarsh terminus. I believe the fare at the time was 5/6 (27.5p) return each. At the time I was an apprentice draughtsman at Bison Concrete in Stourton, Leeds and used to catch the same Burrows 99 service home to Wakefield outside the works gates at 5.00pm. I was attracted to the bright red livery of the Buses. Regarding request for photos of United buses which operated the 128 Scarborough to Helmsley service and views at Pickering depot, I have uncovered this view of two of the Pickering based buses. Copyright is Colin W Routh. Just a note about the Scarborough & District fleet name. This was originally used by E H Robinsons in the early 1900’s when they had the largest fleet of all weather charabancs in the North East based at the railway yard in Scarborough. These were mainly Plaxton bodied Lancia’s as Robinsons were the main agents for Lancia in the area. Robinsons were taken over by United in 1926 who inherited the S&D fleet name. I’m a descendant of Thomas Burrows and recently found this article – it’s great to see such enthusiasm for days gone by. Does anyone have any information about Thomas Burrows and his family that they would be able to share with me? Any memory would be appreciated. Andrew Jackson – if you go to the ‘Fleet Lists’ column on this site there is a substantial fleet list (my own compilation and not confirmed as correct) that covers most of the vehicles owned by Thomas Burrows. It would be great if any of your wider family have any fleet photos to share on here. Andrew Jackson-there will be a book coming out on "Tommy’s Bus" hopefully in 2019, if you contact me through this website I can give you more details. Look forward to hearing from you.